After a Google search for a rug for my group music classroom only turned up results over $150, I decided to make my own. Actually it is a giant mat made out of foam tiles that I purchased from Wal Mart at $5.97 per set of 9. I bought 5 sets. The picture above shows a smaller version of my Giant Music Mat. Create a border for the square you’ve made using tiles of different colors. Alternate colors. Use a black marker to draw a different music symbol on each of the border tiles. If you plan to use your giant mat to designate where each child should sit during group class, it is important to draw a DIFFERENT music symbol on each tile. Do not repeat symbols. There are so many ways you can use this mat besides just sitting! As I already stated, it can be used to assign seats. This shortens the time it takes to get kids situated and ready for class to begin. At the beginning of the year or session, assign a unique symbol to each child. This will be their spot. Make sure they know the name of their symbol and what it means. You could even have kids act out the meaning. At a parent presentation, kids could “show and tell” using their symbol. Have them hold up their tile while presenting it. What other ways can you think of for using the Giant Music Mat? Several small glasses that you can get at any craft store. I got mine at Michael’s. I put different amounts of water in each glass then let the kids gently hit each glass to hear how each glass had a different sound. To make it more fun, I had the kids put a drop of blue food coloring into each glass. Next I had the kids listen for how the sound changed as the water level changed. Once the kids figured out that the more water in the glasses the lower the pitch became, we played the glasses from high to low and low to high with the mallet. To give everyone something to do while they each took turns using the mallet, I had the other kids make airplane arms. When the sounds got higher, they made their airplanes go up high in the sky. When the sounds got lower, they brought their airplanes in for a landing. Everyone liked this a lot – especially the boys! I’m going to miss this group of kids next year, but I know they will do well in Kindergarten. And maybe, just maybe some of them will decide to learn to play the piano by taking lessons with me and then we can have even more fun together! We’ve been doing a lot of songwriting in the piano studio lately and this FREE songwriting contest sponsored by KinderBach.com sounds like a nice add-on to make it even more fun for the kids! Entries must be received by June 19, 2012 and winners will be announced June 21, 2012. When you visit their website there is also a link for Contest Aid Pages. These include colorful cutouts and a staff to help kids put the composition on paper! 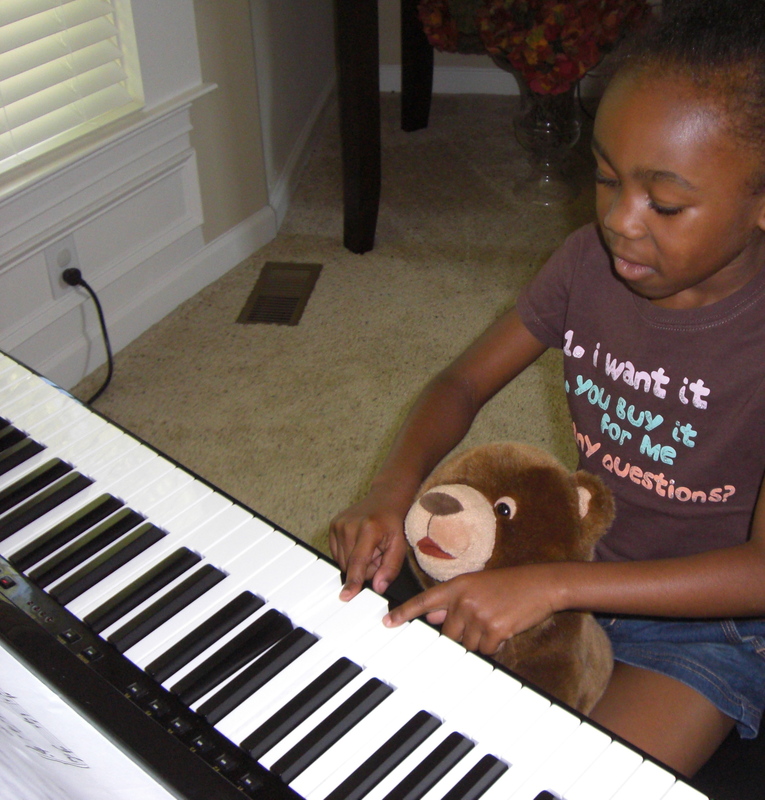 For another idea on how to compose with kids, check out the post I did on my Songwriting Game. I’m going to encourage my students to submit some of their creations, how about you? This post, while not about piano teaching is about kids and their perceptions of musical instruments. In one of my preschool classes a few weeks ago the boys were fighting over these two guitars. Everybody wanted the red one. When I asked them what was wrong with the blue one, they told me it was OK for the girls but it wasn’t cool enough for them. Wanting to know more, I asked what was so cool about the red one. They said, it has fire! If you’re interested in more about musical instrument stereotypes, head on over to http://arcticbassplayer.wordpress.com/2012/04/04/its-only-4-strings-dealing-with-music-related-stereotypes/#comment-80. Reading that post inspired me to share the picture above. Young students learning to play the piano enjoy making connections between what they are doing at school and what they are doing with piano. When my daughter was in Kindergarten her teacher chose a different student to be Student of the Week every Friday. That student got the opportunity to bring home the class teddy bear for the weekend. They were supposed to take care of the bear all weekend and involve the bear in all their activities, take pictures, and show the class on Monday. She saw this as a wonderful chance for her to teach the bear how to play the piano. “Teaching” the bear to play her current song gave her lots of fun practice time that she didn’t even know she was getting!